If you like the noodle salad on the back of the Chang’s Fried Noodle packet then this is the recipe for you! 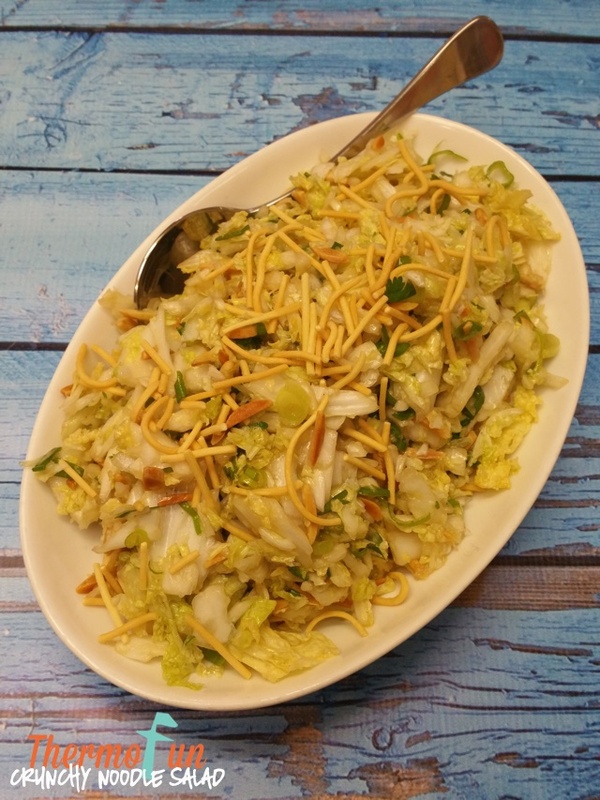 A simple quick dish that will have the family asking for that thermomix crunchy noodle salad again and again and again. I love this with some “roast chicken” as well as some shredded chicken, or to serve at a bbq. When I pack this for work lunches I put the salad and chicken together and then package up the dressing separately so that Diana/Steve can just add as they sit down for lunch. It is a relatively cheap meal to add to your menu plan & always a crowd pleaser when hosting/attending get togethers. Place ⅓ cabbage and coriander into TM bowl and chop 2-3 sec / speed 4. Set aside into a large salad bowl. Repeat again with another ⅓ of the cabbage. Then repeat with the final ⅓ of cabbage. Mix oil, sugar, vinegar, sesame oil and soy sauce into a small bowl and combine with cabbage. Add almonds, spring onions and noodles to salad bowl and toss. Wow!! !This noodle salad recipe looks yummy and as tasty as it looks! !Thanks for sharing!!! Not everyone can handle coriander…any suggestions of what to substitute?